"Little Owl!" the teacher calls. "It's not time to sleep at all." Follow mixed-up Little Owl as she drifts off in class at Night School. 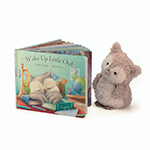 It might sound funny, but Wake Up Little Owl is the perfect story for bedtime! This bonny board book is adorably drawn, and sure to soothe little chicks to sleep. Pair it with Jellycats Little Owl plush (Sold Separately) to make a great Birthday, Baby Shower, or Just Because gift. Plush Not Included, Sold Separately.